Some people may happen to that ASUS Smart Gesture cannot work, or after Windows 10 update, the application cannot be found. When you try to open it from the taskbar, the ASUS Smart Gesture icon is missing. You can do nothing to reset or check it. This will be numerous problems if the ASUS Smart Gesture work failed or ASUS TouchPad driver meets error with Windows 10. For example, ASUS touchpad two fingers cannot be used well in Windows 10 or ASUS smart gesture failed to load image files. Here are 6 ways telling you what to do when your ASUS touchpad is not working on Windows 10. All the ASUS laptop touchpads are designed into two types: ClickPad without the left/right buttons and SmartPad with the left/right buttons. In ASUS official site, it said the ASUS smart gesture AP only supports the ClickPad design. 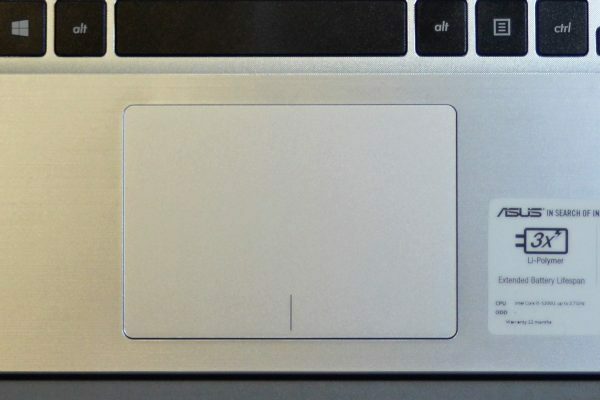 You should identify what the touchpad type you are using. Normally, if you are using a ChromeBook or ZenBook, it will support ASUS smart Gesture. The above image is two different types of your ASUS notebook touchpad. So if you are using the Smartpad, you cannot use the ASUS smart Gesture. And even though you install it in these Notebooks, the Smart Gesture will do nothing. If your ASUS Smart Gesture has no response when you touch the finger or fingers on it, maybe the touchpad function is turned off. So you can re-enable it. For ASUS notebook, press FN + F9 to enable it to make ASUS Smart Gesture work properly. So at first you need to know how to turn on ASUS Smart Gesture if it is disabled by accident? 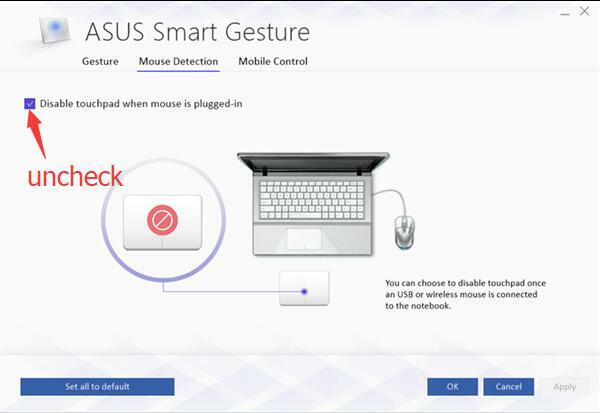 If you connect a USB or wireless mouse to laptop, and the mouse detection in ASUS Smart Gesture is set to disable TouchPad, it may cause ASUS Smart Gesture stop working. So if you want to use the mouse and Smart Gesture, you should uncheck it. 1. 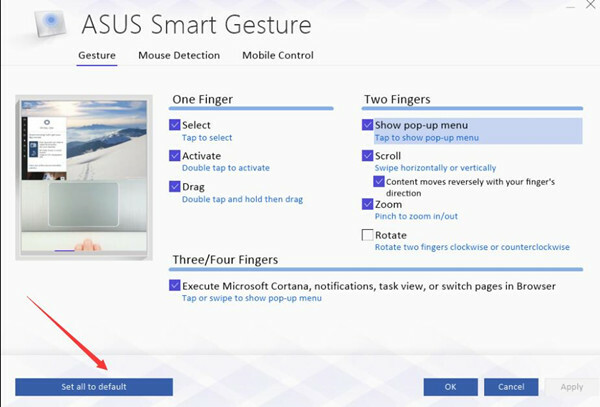 Open ASUS Smart Gesture, and choose Mouse Detection tab. 2. Uncheck the option of Disable touchpad when mouse is plugged in. Now, even though you plug in a mouse into the Notebook, you can also use the ASUS Smart Gesture to do all the things. Tips: For the mouse checking, there is another easy way you can take. If you have a USB or wireless or Bluetooth mouse connected, try to plug off the mouse cable or USB receiver, and then move your finger to the ASUS TouchPad to see if the mouse cursor run. Maybe the ASUS Smart Gesture work failed appears due to some incorrect settings, and you can fix it by resetting Smart Gesture. 1. Open ASUS Smart Gesture. You can type its name in the search box beside Start Menu. 2. In Gesture tab, click Set all to default. All the Smart Gesture settings will go back to default. Step 3: Click Apply and OK. Restart your computer. Then you will find the problem is solved. And you can move the cursor with your finger when it touches the TouchPad. Sometimes ASUS Smart Gesture cannot work on your Windows 10 and Windows 7 because the software is outdated or there are some errors in this software. In this case, you can uninstall this program in control panel, and then download a new one. Steps are as the following. And there are several ways to uninstall it. 1. Type Control Panel in the search box and click the result. 3. 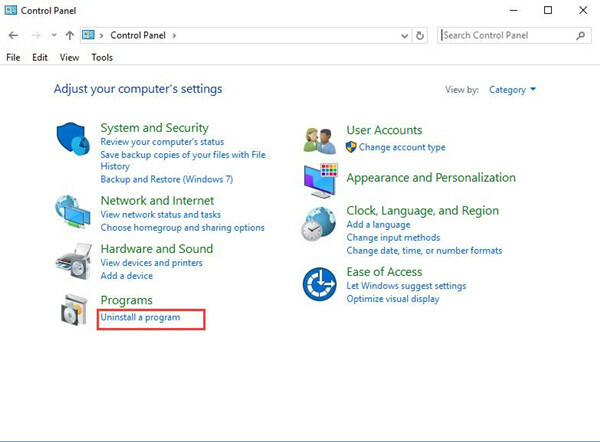 Locate ASUS Smart Gesture in the list and right-click it to uninstall the program. This is the normal way to uninstall it. 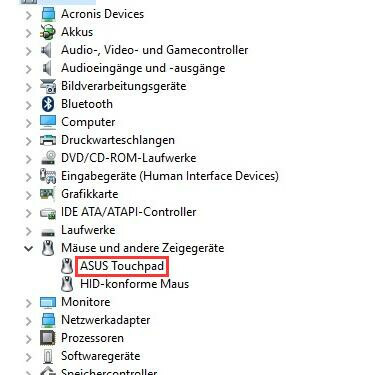 But many people said that they cannot find ASUS Smart Gesture in control panel or there is only the Windows Driver Package – ASUS (ATP) Mouse. 1. Open Windows 10 File Explorer by double-clicking This PC on your desktop. 2. Search ASUS Smart Gesture on the top right corner. Then all the files related to ASUS Smart Gesture will appear. 3. Delete all the files. You should know that these files will not disappear until you restart the computer. 4. Restart your ASUS computer. After uninstalling ASUS Smart Gesture in Windows 10, 8, 7, you should install the new version now. You can download the Download ASUS Smart Gesture in ASUS’s official website. 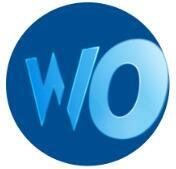 You will find the download link at the bottom of the page. You can follow your Windows 10 version to consider downloading the 32 bit or 64 bit version. Before you install the ASUS Smart Gesture, you should reinstall the ATK drivers. And you can get it from here: ASUS ATK Package driver (32-bit) and ASUS ATK Package driver (64-bit). After it is reinstalled, you need to customize your ASUS touchpad settings again. Then you can use your ASUS Smart Gesture. And another thing you should know is that after installing ASUS Smart Gesture, the ASUS ELAN TouchPad driver and ASUS Virtual Touch will disappear. Because ASUS Smart Gesture is more powerful, you will not need the TouchPad driver again. Of course, you can also update the TouchPad driver. After you installed ASUS Smart Gesture, you will see the ASUS TouchPad in device manager. If you have checked that your ASUS smart gesture is enabled, what confuses you is that it still cannot work. You can try to update the ASUS touchpad driver for Windows 10 to make it work normally. Actually, the ASUS TouchPad driver is the ASUS Smart Gesture driver. If you think the ASUS Smart Gesture work failed is a complex problem, you can use Driver Booster. Driver Booster can fix ASUS Smart Gesture driver issue easily and fast. You need to download Driver Booster. And then Driver Booster will scan and update for you automatically. And here is the tutorial with pictures: update ASUS Drivers automatically. All you need to do in the whole updating process is to click three times and Driver Booster will finish the downloading in several seconds. You can type Device Manager in the search box and press Enter to the Device Manager window. 2. Locate Mice & other pointing devices and expand it. 3. Right-click the ASUS touchpad and choose to Uninstall it. 4. Close the device manager and restart the ASUS Chromebook, ZenBOOK or ZenBook Pro. After you reboot the computer, you can see the ASUS smart gesture and the touchpad can work well in your ASUS this time. Above all, these are the best and most common ways to help you resolve the problem of the ASUS smart gesture not working. Whatever way you would like to choose, it will set your mind at ease if you can follow the steps one by one.